Started more than 50 years ago by organist Katrina Munn and her musical group of friends throughout the Upper Valley, the annual Palm Sunday Choir Festival has become a favorite event in the Bradford area. This year’s festival will be on March 20, at 7 p.m. Many area church choirs, groups, individuals and musicians come to sing anthems. The choirs join together for a combined presentation. This year it will include Mozart’s “Ave Verum” and Gaul’s “They That Sow in Tears.” The high point of the festival are the hymns, lifted up in glorious voice by more than 200 gifted singers, always ending with “All Hail the Power of Jesus’Name.” The festival is now the last of the six Sunday evening Lenten services sponsored by the Bradford Inter Church Council. The culmination of the evening this year will again be Organist John Atwood at the console. Here are two more musical Advent/Christmas resources. The first is the 2014 service of Lessons and Carols from the Chapel of King’s College, Cambridge, in England. For a real treat that will enrich the experience greatly you can read the program handed out that evening by clicking here. The second resource is another John Eliot Gardiner performance of a masterpiece of J. S. Bach, the Christmas Oratorio. This is a long piece–it is actually six cantatas put together to form the Oratorio. It is well worth listening to in entirety, but you could spread it out over six days of Christmas as it was originally performed. Below are links that give information and translations. Bradford Teens are sponsoring a Christmas Carol Sing-a-Long to be held on Friday, December 18th at 6:00. Gather at the Bradford Town Gazebo and join the teens and sing along with Randy Odell playing his guitar to your favorite Christmas Carols. All ages are welcome. Bring the children and start a new Christmas tradition. Here is an extraordinary men’s choir singing two extraordinarily beautiful Ave Marias. The first two videos feature Franz Biebl’s Ave Maria: the Chanticleer album recording followed by a rougher video recording of the group performing it live. The third is Ave Maria…Virgo Serena by Josquin des Prez. If you do not know these, prepare to return to them again and again! Here are two additions to our Advent music collection, both from the album Light of the Stable by Emmylou Harris. The first is a fun seasonal song from the remastered and expanded release of the album, the second a beautiful contemporary carol from the original version. The album is more for Christmas than Advent, with many carols that Emmylou blesses with her gifts of arrangement and voice. Advent has its own tradition of music apart from Christmas. One of the classic Advent hymns is Wake, Awake for Night Is Flying. Below are two versions of a famous cantata by Johann Sebastian Bach based on that hymn for you to enjoy. A translation of the text is available here. If you enjoy Bach, here are some beautiful cantatas he wrote for the season. You can find translations of the texts by clicking here. This short clip is the finale of Lynnette Combs’ performance at the 12th annual Katrina Munn Memorial Concert, on November 1, 2015. The piece is J.S. Bach’s Fugue in E-flat, BWV 552. Please join us for the 12th Annual Katrina Munn Memorial Concert, Sunday, November 1st at 4:00 p.m., at the Bradford Congregational Church, UCC. 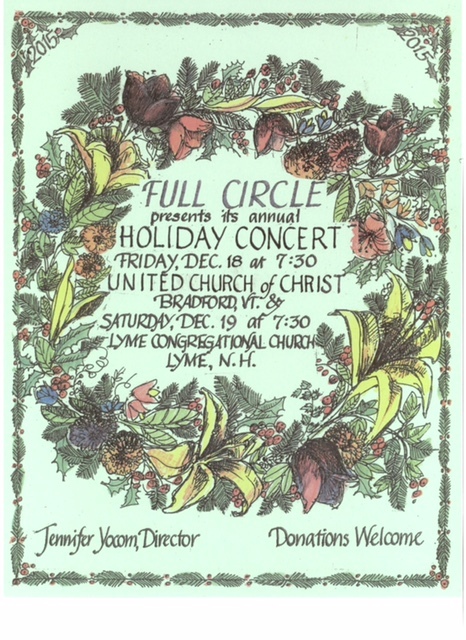 Featuring guest artist Lynnette Combs, with special guest Andrea Brightenback, English horn. It’s sure to be a wonderful concert!